How Do You Graph the Natural Base Exponential Function? 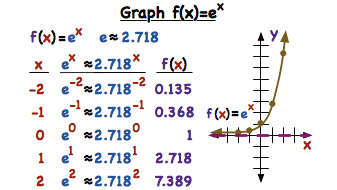 Want to graph a natural base exponential function? Make a table of points! Then plot the points, connect them, and you have your graph! Follow along with this tutorial to see the entire process step-by-step. What is the Natural Base Exponential Function? The natural base exponential function is actually a function that's shorter than its name! This tutorial introduces you to this special function and shows you what it looks like.